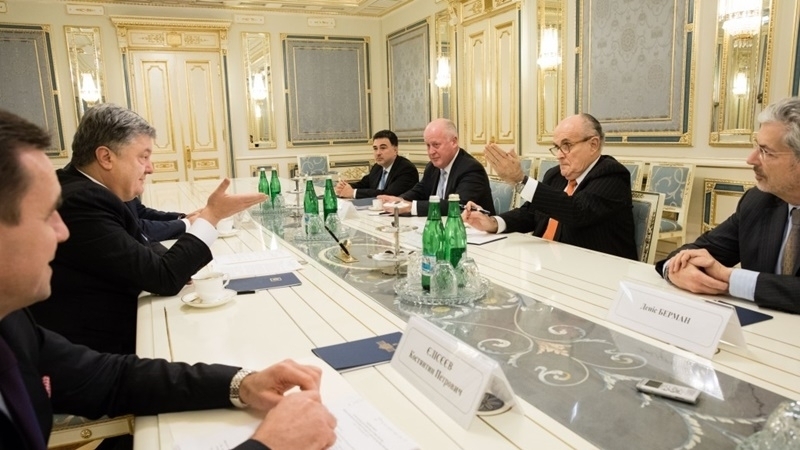 President of Ukraine Petro Poroshenko held a meeting in Kyiv with the former mayor of New York Rudolph Giuliani. During the meeting ways of overcoming Russian aggression against Ukraine and reform in the country were discussed, according to the press service of the President of Ukraine. During the meeting Poroshenko stated the need for cooperation between the US and Ukraine in the field of cyber-security. “In turn, Rudolph Giuliani expressed gratitude to the Head of the Ukrainian state for the meeting. He noted that, since his last visit in 2004, impressive changes have taken place in Ukraine and Kyiv," reads the reported. Earlier, Petro Poroshenko dismissed the Deputy Chairman of the Foreign Intelligence Service Vladimir Sinkevich. The reasons for dismissing Sinkevich are not specified on the website of the Head of state. Moreover, on October 18, the President dismissed the First Deputy Head of the Foreign Intelligence Service Ihor Razinkov.